Empire Fish – By far the best source for oysters and the price is nothing short of amazing when compared with anywhere else. They run around 6-7 bucks a dozen and it is a rare occasion that you get a bad oyster. Most stores charge 80 cents to 1.00 each and 2 out of 3 are inedible. If you are getting oysters I don’t care where you are in the metro area, take the drive to Empire. They also have some great fresh fish (though sometimes the selection is not as interesting as it is at Sendik’s or Grasch Foods). Sendik’s Fish Market in Whitefish Bay – Do not take this to mean that you can go to any Sendik’s and get great oysters. 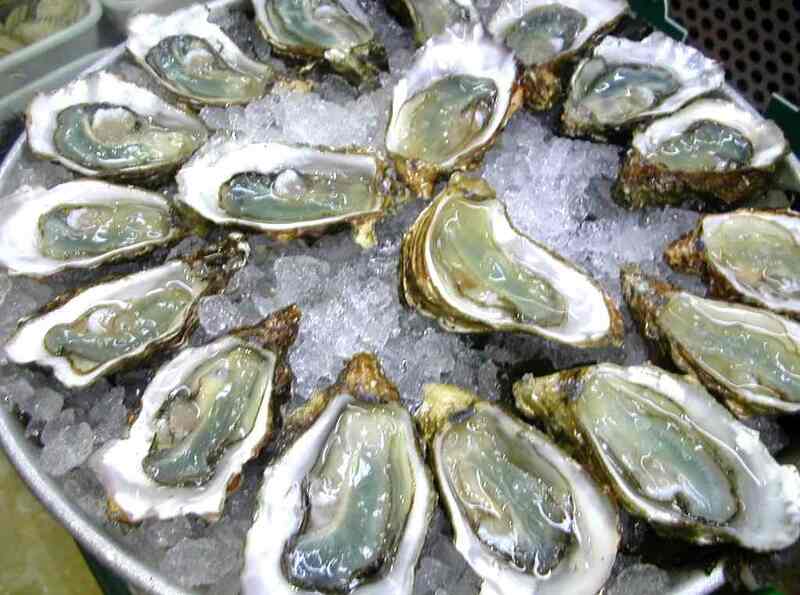 Only the fish market has quality oysters and they are usually reasonably priced. I haven’t been there in a year but they usually have 2-3 varieties. When buying oysters, your fishmonger should gently tap any oysters to make sure they are still alive. If you go to somewhere like Pick n’ Save the “fishmonger” is usually just some employee who couldn’t tell a catfish from an Ahi tuna steak. They are usually somewhat clueless and they will just grab the first twelve oysters they see. This is a bad thing, trust me. When you get home, double check the oysters and make sure they are closed or close with a gentle tap on the top of the shell. If the oyster sounds hollow and doesn’t close, throw it away. It is dead and has probably lost all of its liquor. If you shuck oysters, use an oyster knife. If you don’t have one, use an old crappy knife and a flathead screwdriver. Use the screwdriver to pry open the oyster at the hinge, then insert the knife and wiggle it around to fully open the oyster and loosen the bivalve from the shell. A good oyster knife will serve both of these functions. Serve oysters on the half shell over crushed ice with some dishes of horseradish, lemon and cocktail sauce. Have a bottle or two of your favorite hot sauce. To be honest, I prefer oysters with nothing but the liquor in the shell. I think that the clean taste of a freshly shucked oyster can’t be beat, If your oysters are somewhere between that stage of fresh and not-so-fresh (but still edible) I recommend a small squeeze of lemon or a dash of hot sauce to improve the flavor. I recommend that you have those accompaniments for your guests. If you want some great sauces, try Man's Best Friend. They are made in Wisconsin with great ingredients and some interesting flavor combinations. Empire Fish is located at 11200 Watertown Plank Road in Wauwatosa. They can be reached at 1-800-236-4900 ext. 301. Sendik’s Fish Market is a stand alone store next to their grocery store at 500 East Silver Spring Drive in Whitefish Bay. They can be reached at 414-962-9525, by e-mail at sendiks@sendiksmarket.com.